Today is our final performance of Cardillac. This is quite a spooky murder story with music that is both highly romantic and lyrical, and at the same time dramatic and angular. 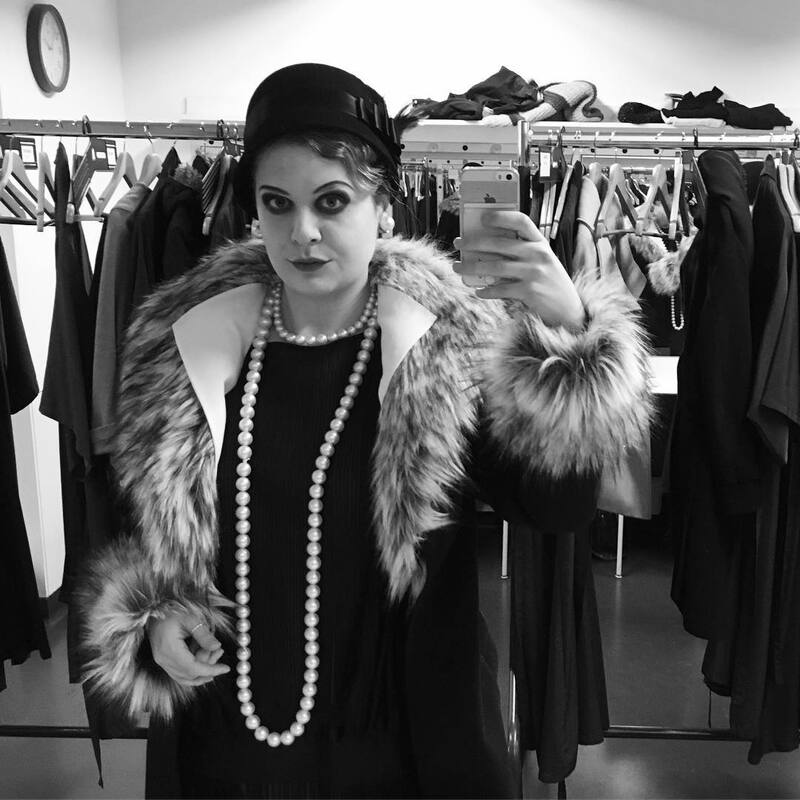 The production has been set in the 1920s. The set and many of the costumes are all in Black and White. The designers have clearly been inspired by film noir. I love the coat that I get to wear, with it's fur collar and cuffs: it makes me feel like a diva! However, the makeup is a little on the scary side for my taste, but it works very well on stage in the context of the opera. It makes the chorus look unidentifiable as individuals, and more like duplicates of the same person. I find it very funny when I am in the wings of the theatre in the dark, and I can never quite tell which of my colleagues I am standing next to! "Cardillac from 1926 is as gripping as a spine tingling whodunnit, at the same time as offering a nod to the contemporary world of Antwerp jewellers. The libretto, based on an early crime novella by E.T.A. Hoffmann, tells a timeless story. Hindemith's austere music is exceptionally to-the-point and perfectly captures the dramatic situation. A diamond in the rough in the hands of director Guy Joosten. 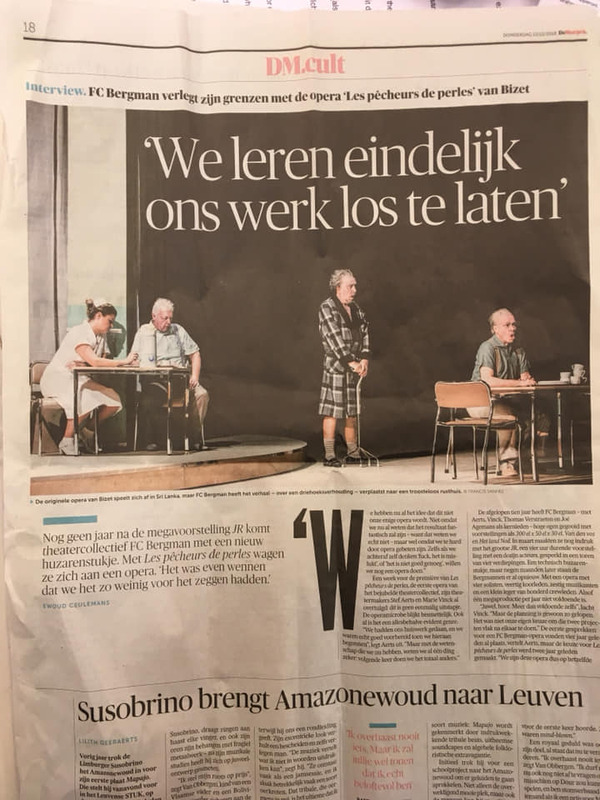 Length: 1 uur 40 min, no intermission German with Dutch surtitles"
Nurse Jenny was in the Belgian Newspaper “De Morgen” on Thursday as part of their article on our production of Bizet’s Les Pêcheurs des Perles! My favourite performance with Opera Vlaanderen so far has to be this unique production of Bizet's Les Pêcheurs de Perles. 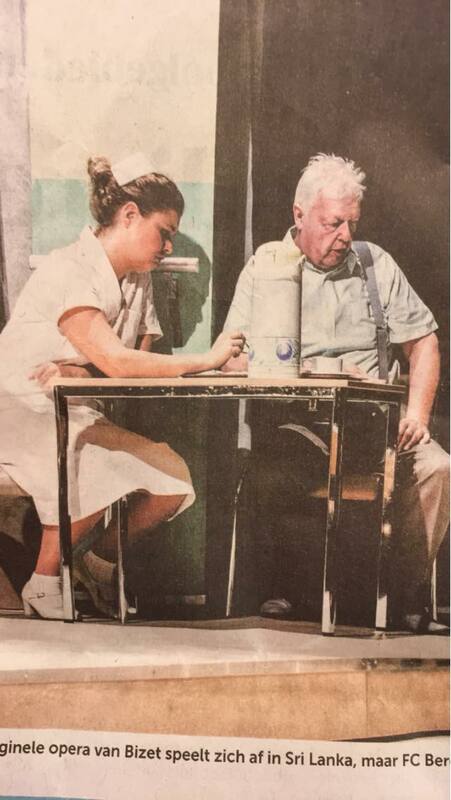 Set in an old people's care home, this production looks back on the lives and loves of the past. Instead of physically and literally diving for pearls, the characters in our production are diving for pearls of memories within their own lives' journeys. I play a nurse who works in the morgue. So now all of my colleagues have nicknamed me "Nurse Jenny". And one of my friends who came to watch said that I was like "an Angel of Death". "Les Pêcheurs de perles, Bizet's first great attempt to write a dramatic lyrical drama is a hidden gem, often overshadowed by Carmen. But all that will surely change in the hands of the stand-out theatre collective FC Bergman. They immerse the story about the transience of love and friendship in a fascinating world. A must-see opera debut! In directing Les Pêcheurs de perles, the internationally acclaimed Antwerp theatre collective FC Bergman are venturing into opera for the first time. They mingle a hard realism with a mysterious, dreamlike atmosphere, a highly suitable combination for an opera that, in both the music and the story, connects a bygone age with the immediacy of the now. With this production, the Belgian conductor David Reiland will also be making his debut at Opera Vlaanderen." My second production with Opera Vlaanderen was the mind boggling, tongue twister of an opera: Satyagraha. It was a fun challenge to learn this opera (in Sanskrit) in a shorter time than the rest of my colleagues. When I first got the score, I remember thinking that this opera would be impossible to memorise. All the companies that I know have performed this in the past, have had a prompt screen or a person mouthing the words at them. But we performed the whole thing from memory without it. I was extremely proud of the work that we put into this performance. It was extremely difficult, but that is what made it so rewarding. "In Satyagraha, Philip Glass shows how Gandhi's ideas can change the world. Director and choreographer Sidi Larbi Cherkaoui creates, together with stage designer Henrik Ahr and costume designer Jan-Jan Van Essche, a unique world in which both the narrative and the philosophical elements are united in a meditative performance. The eternal movement is embodied by the dancers of Ballet Flanders and Eastman. The Chorus of Opera Vlaanderen also has a leading role to play. Satyagraha, "the power of truth", is the philosophy of Mahatma Gandhi (1869-1948), who promoted nonviolent civil disobedience in the face of injustice. Following his opera Einstein on the Beach (1978), in Satyagraha (1980) the American composer Philip Glass further developed the idea of an opera that is built up through a series of associative images. Glass describes this type of theatre experience as like leafing through the pages of a photo album. Following Akhnaten in the 2014-2015 season, with fascinating costumes designed by Walter Van Beirendonck, Opera Vlaanderen will be bringing a second masterpiece by Philip Glass to the stage. As was the case for Pelléas et Mélisande in the 2017-2018 season, Sidi Larbi Cherkaoui will be invited to act as director and choreographer once again. In this opera, his sinuous language of movement embodies the eternal struggle against injustice. Musically, Glass' astonishing minimal score will be brought to life by conductor Koen Kessels. 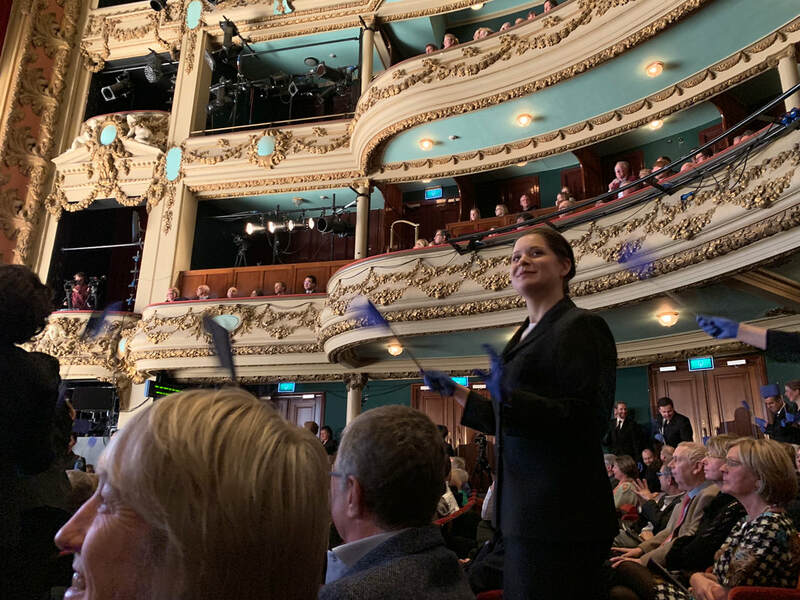 Satyagraha is a coproduction with Theater Basel and the Komische Oper Berlin and received the special support of the Friends of the Opera Ballet. Length: 3 hours 30 minutes, incl. two intermissions Sanskrit with Dutch surtitles"
My first opera production with Opera Vlaanderen was Wagner's Epic Masterpiece Lohengrin. This opera lasted nearly 5 hours and was full of glorious music. With a chorus of 80 people, it was extremely loud to rehearse and be on the stage in the middle of it all. After this performance, I realised how loud opera can really be. I've had tints ringing in my ears ever since. This taught me an important lifelong lesson- wear earplugs to work; especially when your work is performing Wagner. I have put a couple of links to videos from our rehearsal process and my favourite photos from the production. With such a big cast, it's hard to spot me. It's like playing Where's Wally - but instead looking for me! "The icing on the cake for our Wagner aficionados: Lohengrin. Opera Vlaanderen presents a new take on Wagner's stylistically most advanced romantic opera by the leading American director David Alden. The production will serve as both a high point and a glorious send-off for the genre. In Lohengrin, too, Wagner's favourite theme of redemption is at the core, but this time, the accent is on its illusory nature. According to a legend, one day a miraculous hero arrives in the Scheldeland region, in a boat drawn by a swan. He helps to exonerate an accused man and marries a young girl. But when she asks him who he is and where he came from, he has to bid her farewell and depart again, leaving everything behind. By situating the Lohengrin legend in a historical context – the German Empire in the 10th century – Richard Wagner was able to imbue the fairytale content with an unmistakable social dimension. The misunderstood Lohengrin, who demands unconditional love and trust, stands for the metaphysically driven artist whose 'mission' must be understood intuitively. Director David Alden, whose is known for his virtuoso handling of choral and crowd scenes, is the ideal figure to illuminate the political and social dimensions of Wagner's opera. After his debut with Pelléas et Mélisande in 2017-2018, the Argentinian maestro Alejo Pérez will once again provide spirited musical direction. Lohengrin is a coproduction with Royal Opera House Covent Garden in London. Length: 4 hours 40 minutes, incl. 2 intermissions German with Dutch surtitles"
Back in September I made my first performance in my new job singing with Opera Vlaanderen. It was a fun and enjoyable way to begin the season. The sun was shining on us in Sint-Jansplein for our open air concert in front of several thousand people. We sang some opera classics such as the Torreador song from Bizet's Carmen, and Brindisi from Verdi's Traviata. But we were mostly showcasing some of the excerpts from the upcoming season, from Lohengrin, to the Pearl Fishers, and Macbeth. "Sunday 2 September 11.30 a.m.: For the tenth time in a row Opera Vlaanderen will offer a unique Sunday morning concert with plenty of excitement. In 75 minutes, we will take you on a journey through all the highlights of the new opera season: from favourites that rank among the Top 100 of classical music, to undiscovered fragments that are just as worthy. The Opera Vlaanderen chorus and Symphony Orchestra are already preparing to shake the cobblestones of the Sint-Jansplein with a series of top soloists, conducted by Jan Schweiger. Klassiek in de stad is therefore not just a festival, it's also a big celebration that consistently draws over 10,000 visitors. For the two-day festival, we are all too happy to emerge from behind our stately facades for a playful mix of celebrated and lesser-known arias and overtures, the sweetest classical melodies and musical surprises, plus the grace and virtuosity of the dancers, performed outdoors. Goosebumps guaranteed. This year once again, the Sint-Jansplein will be the somewhat atypical setting for this now legendary event." Performances will be in Antwerp and Ghent Opera Houses, and we will also be taking the Bizet to Luxembourg.